The Cup-O-mo-phone is essentially 4 touch sliders made out of video cassette tape. The video cassette tape combined with some elastic band turns into a cheap touch slider. 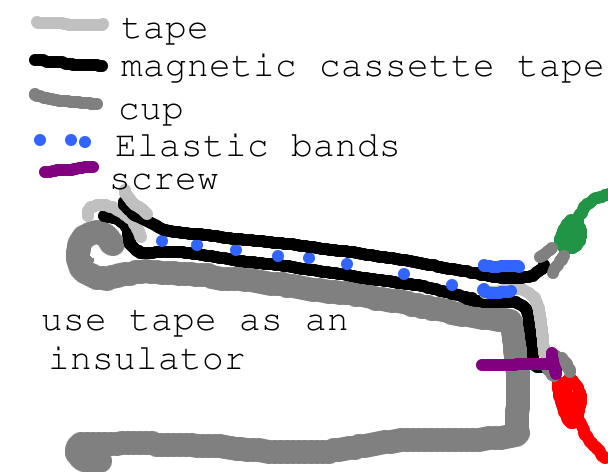 The elastic bands keep the top tape separated from the bottom tape but not far enough that pressure won't join the tapes. I use the arduino's A/D to read in the variable voltage from each of the 4 touch sliders. Then I use csound to convert it into a musical instrument. Note: I found that newer cassettes did not work, their tape did not conduct. Older tapes did seem to conduct, so test your tapes before you destroy them (just use a multimeter and flip the tape open and test). Note the screw, the tape, the magnetic tape, the alligator clips. I have a bunch of a mercury rocker switches I want to add to it.